At Camp School our job is to help your child achieve the very best they can at school. We pride ourselves on our welcoming atmosphere and open door policy as well as strong home school links. We hope that you feel able to come and ask any questions you have regarding support for your child. You know your child best and you may feel that they need some additional help or support for some or all of their time at school. Please find outlined below further information regarding how we as a school provide this support and how you can access it. Support for learning difficulties may be required when children and young people learn at a slower pace than their peers, even with appropriate differentiation. Learning difficulties cover a wide range of needs, including moderate learning difficulties (MLD), severe learning difficulties (SLD), where children are likely to need support in all areas of the curriculum and associated difficulties with mobility and communication, through to profound and multiple learning difficulties (PMLD), where 98 children are likely to have severe and complex learning difficulties as well as a physical disability or sensory impairment. Schools and colleges should have clear processes to support children and young people, including how they will manage the effect of any disruptive behaviour so it does not adversely affect other pupils. The Department for Education publishes guidance on managing pupils’ mental health and behaviour difficulties in schools. Some children and young people require special educational provision because they have a disability which prevents or hinders them from making use of the educational facilities generally provided. These difficulties can be age related and may fluctuate over time. Many children and young people with vision impairment (VI), hearing impairment (HI) or a multi-sensory impairment (MSI) will require specialist support and/or equipment to access their learning, or habilitation support. Children and young people with an MSI have a combination of vision and hearing difficulties. Information on how to provide services for deafblind children and young people is available through the Social Care for Deafblind Children and Adults guidance published by the Department of Health. 1. How does the school know if children/young people need extra help? N.B: A child under compulsory school age has special educational needs if he or she is likely to fall within the definition when they reach compulsory school age or would do so if special educational provision was not made for them (Section 20 Children and Families Act 2014). We strongly encourage parents to keep their child’s teacher updated on any difficulties or issues that you have noticed at home. We will contact you on a termly basis to discuss your child’s progress through parents’ evenings and an annual report. You can also discuss any concerns with your child’s teacher by arranging a meeting with them. If your child is receiving additional support but is not on the SEN register, as well as parent consultations and annual reports, you will be invited to termly meetings to discuss your child’s targets on the provision map. If your child is on the SEN register and is having additional support from external agencies, you may be encouraged to come to school and attend meetings with external professionals, the class teacher and the school SENCo. If you think your child may have special educational needs, please read our school Special Educational Needs policy and contact the SENCo. 3. How will school staff support my child? Provision for children with special educational needs is a matter for the school as a whole. It is each teacher’s responsibility to provide for pupils with SEN in his/her class, and to be aware that these needs may be present in different learning situations. All staff are responsible for helping to meet an individual’s special educational needs and for following the school’s procedures for identifying, assessing and making provision to meet those needs. The Governing Body, in co-operation with the Head Teacher, has a legal responsibility for determining the policy and provision for pupils with SEN. It maintains a general overview and has appointed a representative governor (the SEN Governor), who takes particular interest in this aspect of the school. Ensuring that the implementation of this policy and the effects of inclusion policies on the school as a whole are monitored and reported to governors. They, and the school as a whole, are involved in the development and monitoring of this policy. Note: Many of these responsibilities will be delegated to the Head Teacher and/or SENCo. Taking part in LA SEN moderation. Working with the support of the SENCo to draw up and implement provision maps. Be prepared to undertake relevant and regular training and meetings to support them in meeting the needs of children with SEN. This information is then recorded on either an individual provision map or class provision map dependant on the need of the child. This will be shared with the child’s parent/carer and reviewed termly. If your child is receiving additional support but not on the SEN register, as well as parent consultations and annual reports, you will be invited to termly meetings to discuss your child’s targets on the provision map. We also provide additional day to day information regarding children’s progress where necessary for example through the use of a home/school diary. 5. How will the learning and development provision be matched to my child’s needs? Making the curriculum accessible to all pupils, taking into account differences in gender, ethnicity, social and emotional experiences. Lessons are planned to support a range of abilities and needs. Children’s academic ability is regularly assessed and the lessons and tasks children are asked to complete are adapted appropriately. The model below identifies the different provision in place dependent on the level of need. Wave 1 is the effective inclusion of all children in daily, ‘quality first teaching’. 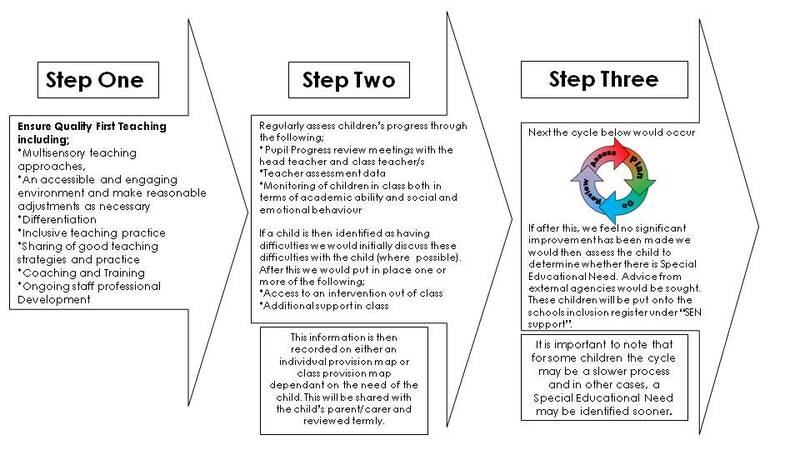 Wave 2 identifies additional interventions to enable children to work at age related expectations or above. Examples of Wave 2 provision we currently use include Rapid Writing, Rapid Maths, Write from the Start, The Talk About programme and Learning Through Movement . 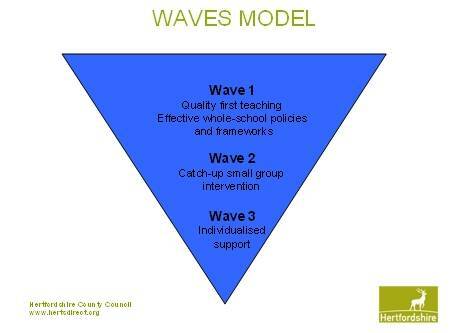 Wave 3 intervention is additional, highly personalised interventions, for example, specifically targeted approaches for children identified as requiring SEN support. 6. What support will there be for my child’s overall wellbeing? 7. What training have the staff, supporting children and young people with SEND had or are having? 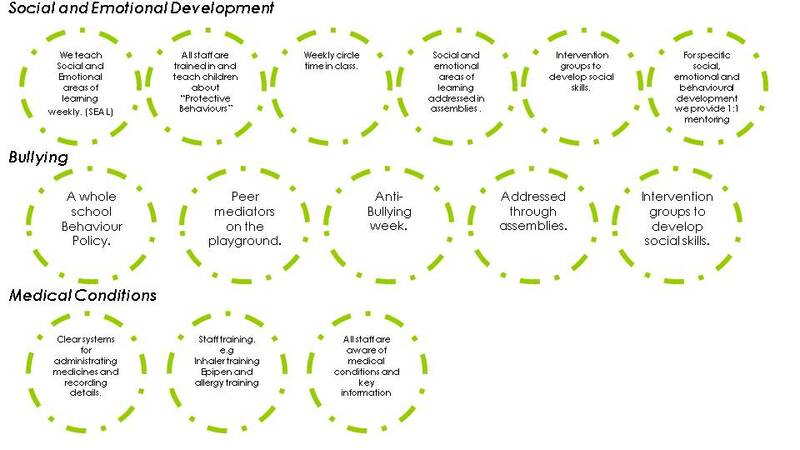 All teaching staff are trained in “Protective Behaviours”- a safety awareness and resilience building programme which helps children and adults to recognise any situation where they feel worried or unsafe, such as feeling stressed, bullied or threatened and explores practical ways to keep safe. All staff are trained in how to support children’s Social and Emotional development. Teaching staff have been trained in supportive children with receptive language and vocabulary difficulties through the use of word webs and mind maps. All staff are trained in the use of inhalers and epipens. Some staff have had diabetes training. 8. What specialist services and expertise are available or accessed by the school? Please click on the links below for more information about the services. We also work alongside physiotherapists and occupational therapists following individualised programmes they have recommended. Although we work predominantly alongside professionals within the National Health Service, we will of course also act on advice provided by professionals working within the private sector. If children have been seen/supported outside of school we will always endeavour to continue this work within school where possible. A Sensory room was installed in January 2016. The room can be tailored to either calm or stimulate based on an individual’s unique sensory needs. The room can be beneficial for almost anyone. We have received training on effective use of the Sensory room through an outreach service. For family support we have a Family support Worker. Please contact the Head teacher or SENCo for her details. We pride ourselves on our open door policy and strong home school links and hope that you feel able to come and ask any questions you have regarding how to support your child. We offer a range of different ways to explain to you how our teaching and learning is planned. At the beginning of a year we carry out “Transition Talks” to all parents to explain what the year ahead will look like. On a termly basis we send a newsletter to parents mapping out the objectives and topics for the term ahead. We provide an annual report to all parents/carers regarding their children’s progress and their next steps. We run HAFLS family learning for parents/carers with English as an additional language. We provide an annual report and carry out two parents evenings to discuss children’s progress and their next steps. We share children’s targets with parents/carers which can be supported at home. We have recently carried out parent workshops during which we invited parents into school to learn about how we teach maths to the children. We will endeavour to continue running these sessions. In foundation stage we run “Building Blocks” a set of sessions for our Reception parents to attend with their children which highlights the ways in which we teach basic skills in our Reception class and gives them a chance to practice. We also have “Stay and Play” sessions for parents of our Nursery Children. For pre-school children we run “Rainbow Club” on a weekly basis. For children having additional intervention or SEN support we will work alongside you to set and review targets on a termly basis. For children with Education, Health and Care plans or statements, we have a yearly review to assess progress and make necessary changes. 10. How will I be involved in discussions about and planning for my child’s education? 11. How will my child be included in activities outside the classroom including school trips? At Camp we ensure all trips and activities are accessible or can be adapted to be accessible for all children. For all trips, staff carry out a pre-visit to ensure this. We assess the extra support that will be needed for extra-curricular activities and plan for this and risk assessments are carried out. All staff running extra curricular activities are briefed accordingly and are aware of all children’s individual needs where necessary. We increase the adult/child ratio where necessary and in foundation stage, parents of children with SEN may be invited to accompany their child on the trip. During activities such as sports day, we ask the children to decide how they feel the activities could be adapted to suit their individual needs. In some cases, we can provide funded places for children to provide them with the opportunity to participate. 12. How accessible is the school environment? 13. How will the school prepare and support my child to join the school, transfer to new school or the next stage of education and life? SEN support should include planning and preparation for the transitions between phases of education and preparation for adult life (see Chapter 8, Preparing for adulthood from the earliest years). To support transition, the school should share information with the school, college or other setting the child or young person is moving to. Schools should agree with parents and pupils the information to be shared as part of this planning process. Where a pupil is remaining at the school for post-16 provision, this planning and preparation should include consideration of how to provide a high quality study programme. For all Children at Camp we provide the opportunity to spend time in their new classrooms in the summer term before they start a New Year group. We run a transition meeting for parents at the start of each academic year with the new teacher. For children with SEN we increase the amount of time they are able to spend in their new environment to ensure they are comfortable with their transition. We also provide “Transition books” which are documents the children can take home with pictures of their new classroom, new teachers and other key information they can become familiar with over the summer. We run Individual transition meetings with the parents, current teacher, new teacher/s and SENCo to ensure all key information is passed forwards. If children are transferring from our school to another school, the SENCo meets/ contacts the appropriate person at the secondary school to ensure that all key information and documents are shared and passed on. In some cases, the child may make several visits to their new school with a member of staff from ours. In foundation stage all new children have a “home visit” in which their teachers come and meet them in their home environment. we run stay and play sessions during the initial part of the term for parents/carers. We provide all of our reception children with a year 5 “buddy” who they spend time with on a weekly basis and whom they can find on the playground or elsewhere if they need some support. The Nursery children have regular opportunities to visit the Reception classroom before their transition. For children going to other settings, our Nursery teacher has handover meetings with their new Reception teacher to ensure key information is passed on. From foundation stage to KS1 We provide regular slots in the summer term for the reception children to visit the year one classroom and become familiar with the teacher. We provide a graduated curriculum in year 1 in which the children are slowly introduced to the year 1 curriculum whilst still having opportunities to experience the foundation stage curriculum. For transition to secondary school we provide some small group support in school for children who we feel will find the transition particularly challenging. The children have an opportunity to meet a member of staff from their new school and ask any questions they may have, they also visit their new school. For year 6 children with SEN, the SENCo meets/ contacts the appropriate person at the secondary school to ensure that all key information and documents are shared and passed on. In some cases, the child may make several visits to their new school with a member of staff from ours. 14. How are the schools resources allocated and matched to children’s special educational needs? All mainstream schools are provided with resources to support those with additional needs, including pupils with SEN and disabilities. Most of these resources are determined by a local funding formula, discussed with the local schools forum, which is also applied to local academies. School and academy sixth forms receive an allocation based on a national funding formula. Schools have an amount identified within their overall budget, called the notional SEN budget. This is not a ring-fenced amount, and it is for the school to provide high quality appropriate support from the whole of its budget. It is for schools, as part of their normal budget planning, to determine their approach to using their resources to support the progress of pupils with SEN. The SENCO, Headteacher and governing body or proprietor should establish a clear picture of the resources that are available to the school. They should consider their strategic approach to meeting SEN in the context of the total resources available, including any resources targeted at particular groups, such as the pupil premium. This will enable schools to provide a clear description of the types of special educational provision they normally provide and will help parents and others to understand what they can normally expect the school to provide for pupils with SEN.
Schools are not expected to meet the full costs of more expensive special educational provision from their core funding. They are expected to provide additional support which costs up to a nationally prescribed threshold per pupil per year. The responsible local authority, usually the authority where the child or young person lives, should provide additional top-up funding where the cost of the special educational provision required to meet the needs of an individual pupil exceeds the nationally prescribed threshold. 16. Where can I find out about the local authority’s offer of services and provision for children and young people with SEN? 17. Who can I contact for further information? Please contact the school office on 01727851056 and ask to speak to the SENCo. Should pupils or parents/carers be unhappy with any aspect of provision they should discuss the problem with a class/form teacher in the first instance. Anyone who feels unable to talk to the teacher, or is not satisfied with the teacher’s comments, should ask to speak to the SENCo. For a problem that might need time to be explored fully, parents/carers should make an appointment rather than rushing the discussion before or after school. In the event of a formal complaint parents should follow the procedure in the school’s complaints policy.